That’s right, folks! 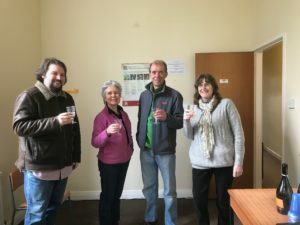 The Library of Light Orchestral Music is now officially moving to new premises in Long Preston. This is, of course, why we have announced two weeks in which we’ll be closed and we’re sure you will appreciate that this is a mammoth task. The move will undoubtedly take longer than the two weeks to fully complete, but we will at least be able to process music requests after this time. Some fun calculations for you to see just how big a job this is! There are 5.1 TONNES of music to be moved. There are many steps in the new premises so much of this music has to be carried upstairs as there are no lifts! There are 19 steps per flight at approx 25 cm a step. This means that if the whole library were to be carried upstairs (which thankfully it isn’t) this would equal a cumulative height of 5750m. This would be equivalent to summiting Mt. Kilimanjaro! With that in mind- WISH US LUCK!